This monthly bill organizer is done with a popular bill organizer spreadsheet called a Microsoft Excel spreadsheet.The template that is used is revenue reservoir bills. 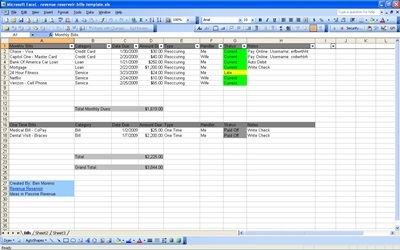 The bill organizer has all you need on this bill organizer spreadsheet. In one column it has the monthly bills, the category, date due, amount due, and category that is called Type. In addition, on the organizer you can put handler, status, notes or anything else you choose. On the bill organizer explanation on the category is the first one which monthly bills, self explanatory category. The next category is the date due. Whatever the due date is on your bill that is what you put next to the monthly bill, the handler would be whoever handles that particular bill. Another feature is that this template has a status column that you can check off on current or late. Also something that is helpful is on the organizer or the spreadsheet is to make a section when, who, and how you paid it. The monthly organizer is on this spreadsheet that makes your life a little more organized. You can find this spreadsheet in the bill organizer template. This template has many other great organizers, not just monthly bill organizers. Knowing what is going on with your money and your bills are hard enough when you cannot put that on paper. You have to see what you are doing on paper. So go to the bill template and use the monthly bill organizer. This monthly organizer will help you put everything in order help you in putting in automated fashion.